Some of the earliest television iterations of powerful kickass women, long before Buffy, Xena, and Sydney Bristow, there were two that had lasting legacies for their impact on popular culture. The iconic Amazon princess of Wonder Woman as played by Lynda Carter and the cybernetic special agent Jamie Sommers aka Bionic Woman played by Lindsay Wagner emerged in the mid-70s capturing the imaginations of boys and girls all over the country. Thanks to DC Comics and Dynamite Entertainment, the two have joined forces in one single comic book giving us the crossover we were denied decades ago. 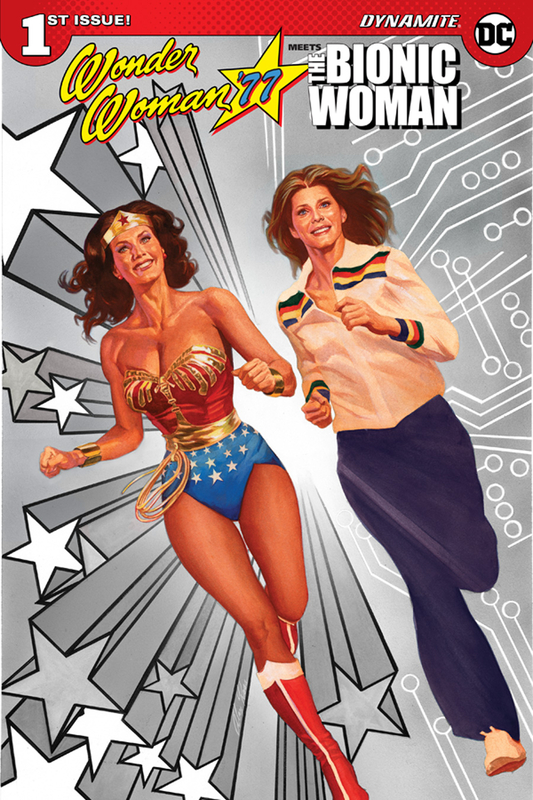 'Wonder Woman '77 Meets The Bionic Woman' #1 by Andy Mangels and Judit Tondora doesn't waste any time bringing the two together. After two brief thumbnail sketches for their origin stories, they help people evacuate a building that was bombed. It's an exciting rescue mission that highlights both of the heroines' strengths including Jamie's famous TV slow-motion sound effect "Deeneeneenee" when she jumps. Soon, the two serendipitously reconvene at a joint task force meeting between their respective government agencies and the two are paired to protect a scientist from the murderous head of a shady organization. As a child of the late 70s and 80s, this is a dream come true. Back when the superhero and sci-fi genre had spiked in popularity, Wonder Woman and The Bionic Woman (a spin-off of The Six Million Dollar Man) was joined by The Incredible Hulk on television and Superman: The Movie in theaters. It was a precursor to the current explosion of comic book adaptations but obviously, the special effects weren't quite as special. Nonetheless, Diana Prince and Jamie Sommers represented how powerful female leads could be in these type of shows. They too were on lunch boxes and had their own action figures like G.I. Joe and the Super Friends. As for the comic, it captures the melodramatic conspiratorial plots that involve moles in government agencies and the threat of a global terrorist that make up the stories of most political thrillers and superhero comics. Diana and Jamie work in unison with great camaraderie and passion for helping people. Always congenial between them but tough as nails against the bad guys. It should warm the hearts of longtime fans but still remains accessible to new ones with the straightforward storytelling. The art is fun and bold with Judit Tondora's creative layouts and outsized action. The 70's tone is well captured in the character designs and period-appropriate clothing. It brought back a lot of memories of days in front of the TV caught up in the adventures of these super women. The panels are well saturated by colorists Michael Bartolo and Stuart Chaifetz giving it a classic comic book appearance creating a colorful vibrant world. 'Wonder Woman '77 Meets The Bionic Woman' is not only a blast from the past but a reminder of what makes superhero comics so great. It's a chance to escape and get lost in the daring exploits of heroes who just get the job done, not for themselves or for the glory, they simply want to make the world a safer place. These themes are timeless and this comic celebrates the best in all of us. Read this book!